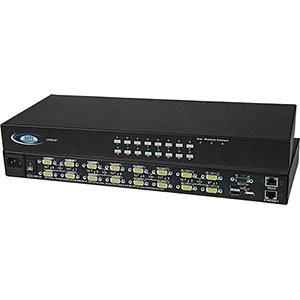 The NTI RACKMUX-V17-N-8USBHD-IP KVM Drawer with Built-In High Density USB KVM Switch and KVM on IP combines a rackmount LCD monitor, keyboard, touchpad mouse, an 8-port USB switch, and a KVM on IP device. Available with forward-folding 17 in. TFT/LCD VGA or DVI monitor. KVM on IP requires no client software. Secure, encrypted browser sessions with authentication.